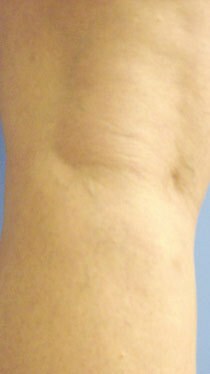 Microsclerotherapy is the method of injecting an abnormal small (spider) vein on your skin with a solution that irritates the lining of the vein. 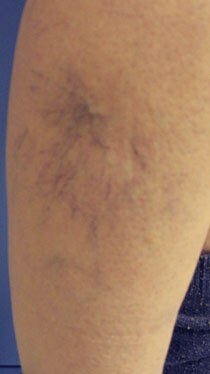 This process causes the vein to eventually close and gradually disappear over time. 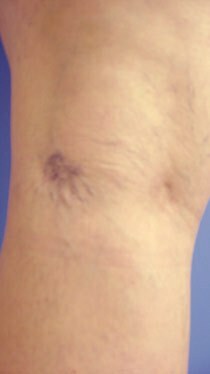 It can be used to treat all sizes of veins but is primarily used to treat the small unsightly veins referred as “spider” veins. In order to treat the smallest of spider veins effectively, a high magnification lens and polarizing light headlamp as well as very fine needles (barely visible to the naked eye) are used in our office. Each appointment session lasts 45 minutes and the doctor will treat as many veins as possible in that period of time on one or both legs, depending on how many spider veins you have. The injections are not painful and are performed while you are listening to music, reading email, a book, or magazine. You are advised to wear a fitted compression stocking after the procedure, which you will wear for the next 7 days and avoid strenuous activity. You will need to avoid sun / tanning for 2 weeks. Typically a few treatments are needed to obtain the best results as many veins need to be exposed to the sclerosing agent twice to resolve. During you initial evaluation, we will be able to provide you a general idea of how many sessions you will likely need to eradicate the spider veins. Normal daily activities can be immediately resumed after your procedure.